I’ve been looking forward to reading this book for a really long time, and it did not disappoint. I picked up Martin’s last book, This Ramshackle Tabernacle, and recognized at once that I loved his writing and the themes he writes about. But it was a short story collection, and no matter how good the writer and how good my intentions, I just cannot get engaged with short stories. I’ve tried, many times, and I just have to accept this as a failing in me as a reader. So, when I heard Sam Martin was releasing a novel this year, I knew this would be my opportunity to immerse myself in his writing and enjoy what he could do. 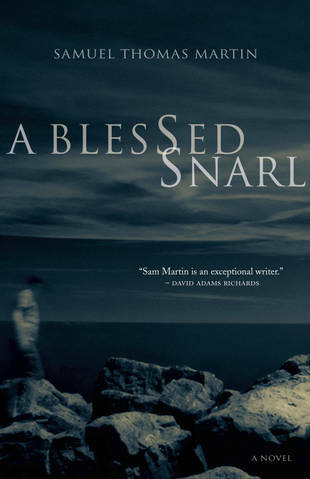 A Blessed Snarl tells several stories, covering a year or so in the lives of a small group of people whose lives become intertwined. There’s Patrick, a Pentecostal minister returning home to Newfoundland to plant a church; Anne, his unhappy wife; Hab (yes that’s short for Habbakuk), their university-aged son; Hab’s new friend Natalie and her roommates Gerry and Lisette. The writing is dense, very literary, and almost achingly beautiful in places. It’s the kind of book that richly rewards a careful reading: you’ll miss a lot if you skim lightly over the surface. Martin grapples with big themes: losing faith and finding it; seeking a sense of home; searching for connection and intimacy. Relationships between fathers and sons are central to most of the storylines, but so are other relationships — all those human contacts we cling to in an attempt to make sense of life’s chaos and violence.